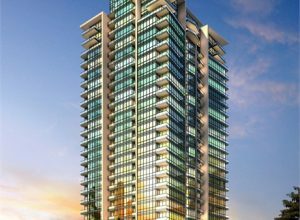 Pinnacle‘s Grand Park project is holding a sales launch for their penthouses this weekend. If you’re looking for the penthouse lifestyle in Mississauga, this event is not one to miss. Grand Park‘s penthouse collection contains 12 suites with 6 on the 27th floor and 6 on the 28th. The 28th floor units are the sought-after 2 storey suites so future residents will be essentially occupying the 28th and 29th floors. Beyond the generous balcony space on the main 28th floor, the “29th” floor also boasts huge rooftop terraces. Sound like your cup of tea? Stop by the sales centre between noon and 6pm on Saturday or Sunday. It’s located at 3981 Grand Park Drive in Mississauga. And of course, the penthouse collection is just one component of what makes this a great project. The central Mississauga location couldn’t be better and the team of Page & Steele/IBI and Tanner Hill & Associates on architecture and interior design (respectively) is wicked awesome. Moral of this story? Get out to the Grand Park sales centre this weekend to scoop up an immaculate penthouse before the clock hits 6pm on Sunday. For more info email info@pinnaclegrandpark.ca. Call the sales centre at 905 276 3981 or visit the website by clicking here!